It’s that time of year! The harvest is almost over, the first freeze isn’t far off, and we’re just weeks away from snow. 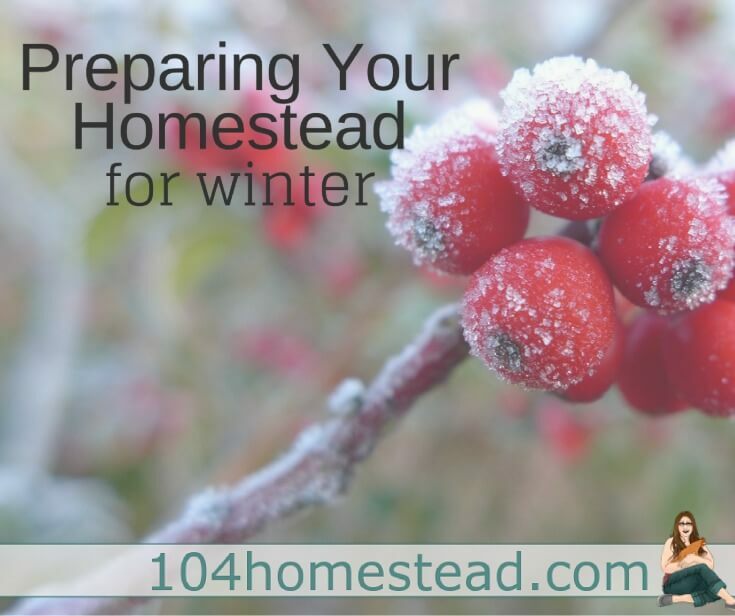 While everyone has their own list of fall chores, homesteaders in particular have an insane amount to get done before the snow starts flying. Start by removing all the dead plants, weeds, and debris from your beds. Cut back perennials to eliminate overwintering sites for insects and disease. You may wish to till the soil and cover it with a layer of compost and mulch or leaf mold. You may also want to read about Putting Your Vegetable Beds to Bed. Next, rake leaves and add them to your compost pile (or turn them into leaf mold for your garden beds). Remove broken limbs from trees and protect the smaller ones from extreme cold by surrounding their trunks with a cylinder of snow fencing packed with straw or shredded leaves. Cut the lawn to three inches — and continue to do so until it goes dormant. This length will protect it from frost damage and surface desiccation. Finally, clean up and store your lawn and garden tools. Empty outdoor containers and store them upside down to prevent cracking during the winter. Empty hoses and pack them away in a covered container. Drain the fuel tanks on your lawn mower and any other gas powered equipment, and keep them in your garage or shed for until spring. Prepping your livestock for winter takes a considerable amount of work, but it’s well worth it. Fall is the perfect time to stock up on feed for your animals. Once winter arrives, the price of most feed skyrockets, so it’s best to lay in a supply as early as possible. Check all other supplies and reorder if necessary. Inspect all livestock shelters to ensure they’ll be warm enough for the coming months. Repair or replace lighting, and wrap pipes to prevent bursting from freezing weather. Install safe heating, but use only if absolutely necessary (animals regulate better without supplemental heat). Place timed lamps in your coop to simulate longer days if you want to encourage your chickens continue to lay. Thoroughly clean coops, barns, and shelters and put in a thick layer of fresh bedding. If you have an area that needs a new fence, or a fence that needs mending, now is the time to do it. Check out tips for winterizing the chicken coop. You’ll also want to have a plan in place for your free range chickens. Forget spring, fall is definitely the season to deep clean your home! Declutter, organize, and then give everything a good scrub down. Anything you don’t use (and won’t use in the future) can be donated or recycled, freeing up space for all the visitors and gifts that accompany the rapidly approaching holiday season. Once the house is shiny clean, inspect your insulation and weather stripping and replace anything that has been worn down or destroyed. Insulate pipes to keep them from freezing. Install thermal curtains or plastic film over your windows to keep out cold. This will keep the house remarkably warm, as well as help to reduce your power bill. If you use wood or pellet stove, stock up on more than enough fuel to get you through a long winter. If you use a fireplace, you’ll want to clean it completely and have a professional sweep the chimney. Keep a few multi-purpose fire extinguishers in easy to access locations and install carbon monoxide alarms in central locations on every level of your home. This will ensure safe heating for the entire season. You’ll also want to have a family communications plan and emergency contact information on hand just in case your family isn’t together when disaster strikes. This will inform family members how to contact one another, how to get back together, and what to do in emergency situations. While this may seem a bit extreme, many homesteaders live in rural areas, so it’s important to be prepared for severe weather and the chance you may be cut off from the city. Once you’ve finished preparing your homestead for the coming winter, take some time to enjoy what’s left of autumn. Falling leaves, apple cider, pumpkins, and corn mazes — there’s joy to be found everywhere. Happy fall, friends! You explained it really well. Can you suggest some outdoor activities one can do in winters?